The hopes of a first championship win of the season were dashed in the most crucial of games at Derby. 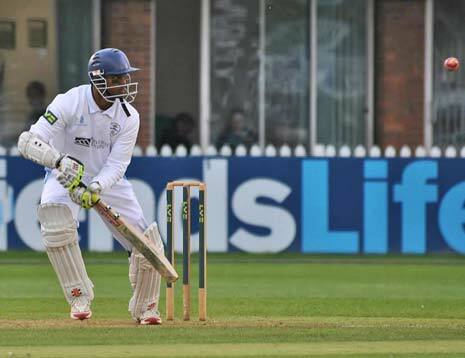 Derbyshire's immediate rivals to escape relegation, managed to obtain the winning points on the final day. Derbyshire's season long problem of the odd bad session reared its ugly head again at the County Ground. They lost their last eight wickets for 56 runs in the morning session, to leave Somerset a victory target of 145 in 73 overs. Somerset made heavy weather of them though despite a solid start from Marcus Trescothick and England hopeful Nick Compton. Somerset scored the winning runs after losing six wickets. Jon Clare with 5-29, his best bowling of the season to date. Derbyshire's batsman couldn't have made a worse start in the morning session when Shivnarine Chanderpaul (above) was caught at first slip for 1 from the bowling of Alfonso Thomas, not a very good shot by the West Indian for someone who is generally so assured at the crease. 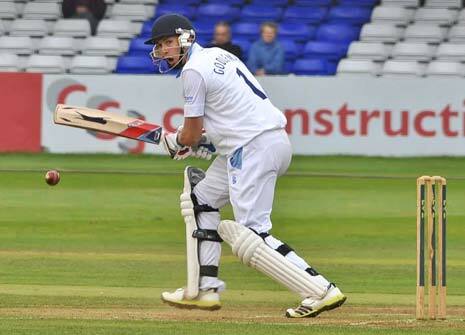 The next to go was Billy Godleman (above) - top scoring for Derbyshire in their 2nd innings with 24 - who edged behind from Craig Meschede. The 21 year old then accounted for Ben Slater the very next ball clean bowled. Derbyshire were then 44-5. Ten runs later and Richard Johnson failed to produce the heroics of the first innings by edging behind off Meschede again. He had now 3 wickets for 4 runs in 12 balls. One of the more frustrating things is seeing a batsman run out completely unnecessarily, and this happened to Jonathan Clare, who edged out of his crease when Wes Durston had driven the ball to mid-on, Jamie Overton quick as flash hit the stumps and Clare was given out. Durston and Tony Palladino managed to get the score to 90 before Marcus Trescothick held onto an edge by Palladino from Steve Kirby. In the same over Tim Groenewald fended off a delivery to James Hildrith at first slip. Derbyshire's innings was ended in the very next over when, after dismissing Overton to the boundary, Durston was bowled the next ball. 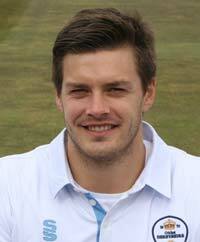 Derbyshire had lost their last three wickets in five balls. This left Somerset 145 runs to win and at lunch they had reached 30 without loss in five overs. Having seen the score through to 60, Somerset lost their first wicket when Marcus Trescothick tried to flick a Jonathan Clare (left) delivery through mid-wicket, only to get a leading edge and Wayne Madsen duly collected. In fact, Clare collected the next four wickets, Dean Elgar edged to first slip, James Hildreth was leg before wicket, Craig Kieswetter was caught behind by Richard Johnson and the big wicket of Nick Compton, who had played beautifully for 56, who also nicked a ball to Durston at slip. That was Clare's 150th in first class cricket. Alex Barrow after playing cautiously edged behind from Tim Groenewald and hopes were raised slightly. In the end though, 145 wasn't enough as Craig Meschede drove the ball though the covers to hit the winning run. Somerset collected their first win of the season and moved out of the bottom two while Derbyshire remain at the foot of the table.